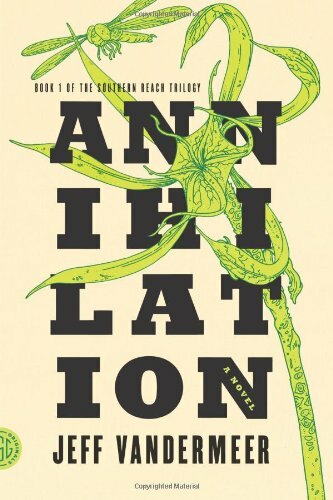 I just finished reading Annihilation, by Jeff VanderMeer, for the second time. Partly an ecological mystery, partly an invasion story, partly a psychological horror story, and partly a meditation on the silent, unknowable gulfs that grow in a marriage, Annihilation is an extraordinary novel, and a new plateau for VanderMeer. It opens as the members of the Twelfth Expedition — four scientists, all women — enter an ecological twilight zone known as Area X, under the aegis of an enigmatic government body called the Southern Reach. While the novel begins with the unusual, the opening chapters are as secure as the reader will ever be. Annihilation continuously unfolds, like some weird bloom from Area X itself, becoming stranger and more beautiful as it goes along, and raising three new questions for every one it answers. By the end of the book, the novel has cracked wide open; it’s geysering wonders. It is the most transcendent of epiphany stories. Sometimes you read a book that reminds you, as a writer, of what’s possible. It recalls to you a sense of ambition and excitement. It’s the sound of a trumpet calling. That’s what this one is for me. I think you should read it. I had a similarly religious reaction to Annihilation. Have you read Authority yet? Not yet. I re-read this one to get my head back in the right space. Very soon! I wonder how common that is, re-reading Annihilation before moving on. VanderMeer’s prose is so rich that it profited by a second reading, that’s for sure. You may experience the same thing with Authority. VanderMeer has accomplished something very special with these two novels. The third should be a doozy! Agree. It’s an amazing book, innovative, haunting and oddly touching. Love it. Blew me away. Couldn’t agree with your assessment more. Daunting, and inspiring.